Even though the word “Trump” was not in the speech, Brown’s focus was unmistakeable. Instead of addressing the real state of the state — the faltering economy in what has become one of the most unfriendly states to business owners — Brown bragged about how great California is, and threw down the gauntlet to Washington, D.C.
All these items were received in the Democrat-dominated chamber with raucous cheers and loud applause that seemed more appropriate at a campaign rally than the august Assembly chamber. At one point, Brown went uncharacteristically off script and again sounded like he wished he were president when claiming he would fight to defend for “Planned Parenthood” funding. It is unclear how he plans to keep that promise, as leader of the state likely to have the least influence in the Trump administration. Gov. Brown went to great lengths to highlight and praise the role of immigrants in California’s success, erasing the line between legal and illegal immigrant. California’s longest-serving governor reserved his toughest words for the “new oresident” over climate change. Brown acknowledged the “deep divisions,” stating that “alternative facts” and “attacks on science” were deeply disturbing. He warned that democracy is a bottom-up system, and that in the massive protests over the weekend, we “witnessed vast, inspiring fervor” that represented the true heart of the people. And that wasn’t the only area where Brown sought to be seen as a leader of more than just his own party. At one point near the end of the speech, he called out his more vitriolic colleagues to accept “reality” and work to be more respectful of “Republicans” — who really are people, too. But that’s not likely to distract many Californians from the stark reality of what was once their California dream. Brown inadvertently revealed the true state of the state — debt-ridden, overtaxed, and over committed to the point it cannot even repair the state highways or pay out pensions owed without levying yet another tax. 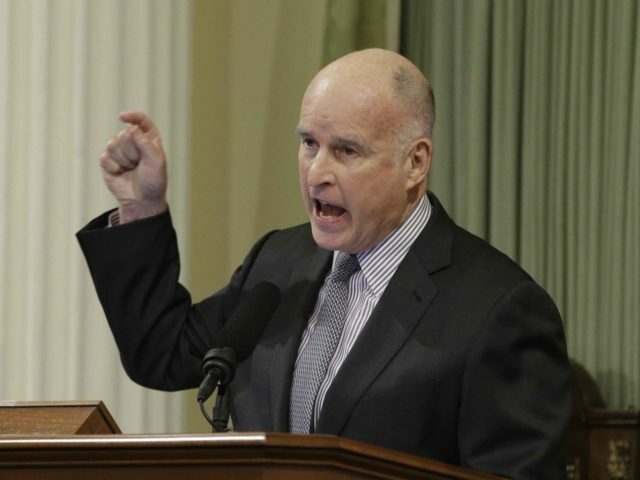 Surprisingly, Brown acknowledged federal supremacy in the area of immigration, but then highlighted how California has staked out protections for “undocumented Californians,” reiterating his commitment to defy any enforcement of federal law that threatens illegal aliens in the state. By acknowledging that Covered California (the state’s version of ObamaCare) requires tens of billions in funding from the federal government, Gov. Brown gave President Trump an opening — and revealed the Golden State’s Achilles heel. By repealing ObamaCare, and ending this massive subsidy, California’s budget will fail. California may be an exceptional state in many ways, but it will not be the “great exception” when it comes to basic budget math. To borrow the governor’s own words, you can’t make 2 times 2 equal anything but 4 — not even in California. No wonder so many Americans are fleeing California for an “alternative reality” — one without Governor Jerry “Moonbeam” Brown.